Welcome to the August edition of Brookwood News. School is out for summer, there are boats on the canal and we are all making the most of the sunshine. Historically there wasn’t a newsletter in August but, as it has just got off the ground again, we felt continuity was important. So here it is with thanks to newshound Liz Swain, all the contributors and to you for reading it. 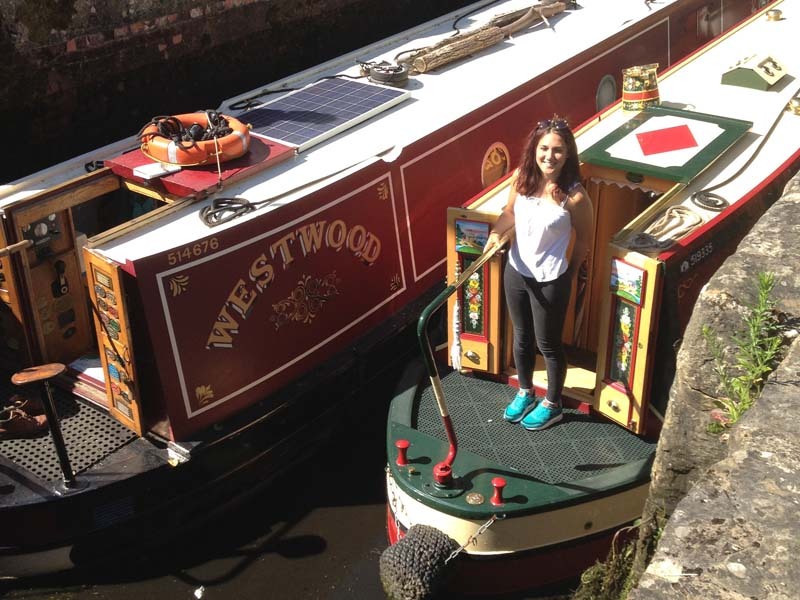 Narrow boats Westwood and Brindley in Brookwood lock en route towards Basingstoke from Birmingham via Bristol! ‘The lamps are going out all over Europe, we shall not see them lit again in our lifetime.’ Sir Edward Grey, Foreign Secretary, uttered these words on the eve of Britain officially entering the First World War. Exactly 100 years later The Royal British Legion is encouraging everyone in the UK to turn off their lights from 10 to 11pm on 4th August 2014, leaving only a single light or candle for this symbolic act of reflection and hope. The poppies you can see in Brookwood have been provided by Woking Borough Council to support the First World War Commemorations. 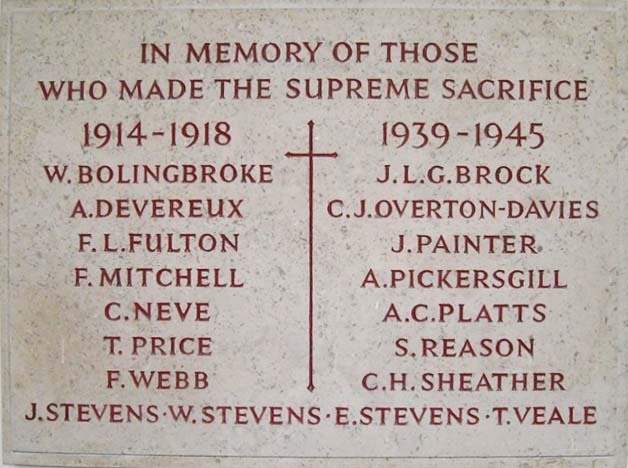 The First World War began on 28th July 1914 and Britain declared war on Germany on 4th August, so it is fitting that this month we remember the men of Brookwood who fell in that conflict. They are commemorated by the plaque in the Large Memorial Hall. The halls will be closed for four weeks from 4th August for refurbishment. In the large hall there will be modern, secure and disabled-friendly doors and new flooring in the entrance, the toilets are being updated, and the guttering and soffits replaced. There will be more efficient lighting in both halls. The small hall is being completely redecorated. Some smelly sewer work is required. A new handrail up the slope is already in place, proving popular with young gymnasts – mind the concrete! Thanks due to Woking and Surrey Councils for grant assistance, and prudent financial management by the volunteer committee who run the halls for us all. The shiny new facilities will be available again from early September, with discounted rates for locals and charitable groups. Diary date – Admire the work on Saturday 6th September from 3pm when the halls will be open for the Allotments Society Annual Show. create a perfect habitat for water voles, allow light in and encourage non-woody marsh plants to grow. Many species will benefit including dragonflies. About 50 years ago the meadow area was grazed to prevent encroachment and help increase wildlife diversity. 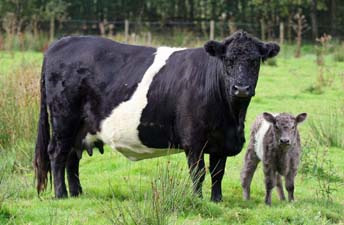 SWT has reintroduced grazing with a small herd of placid Belted Galloway cattle. The unique markings of these cows were specially bred by Scottish farmers to allow them to be seen from long distances on the highlands. The animals are naturally without horns (polled). This means that they are easier to handle and are less intimidating to members of the public. Annual Show Saturday 6th September GPAS came into existence in 1977 and was originally was located off Westfield Avenue, but in the 1990s it was advised it would have to relocate because of heavy metal contamination on the site, which had previously been a household refuse tip. After an 18-month search the decision was made to provide a 90-plot site on a field belonging to the council off Sheets Heath Lane and in early 1995 members were at last able to move onto their new plots. During the next 20 growing seasons there have been highs and lows – droughts, floods, badgers wrecking fruit and vegetable crops, 25 vacant plots at one time then a waiting list of 40 people. A decision to divide some of the plots in half was very successful. One year a Colarado beetle was found which caused panic and led to weekly inspections by the then Ministry of Agriculture. An apiary was built 4 years ago and currently there are 7 hives in full production, with members’ fruit and vegetables benefitting greatly from ‘local’ pollination. GPAS has held an annual fruit, vegetable and flower show since 1980 and this year it is on Saturday 6th September in Brookwood Memorial Hall. Immediately after the judging is completed at about 3pm the hall is open to members and visitors. Refreshments are provided, there is a raffle – proceeds to the Hospice – and finally there is an auction of vegetables and flowers. If you are keen to join the band of growers in Sheets Heath Lane, give the Chairman a ring on 01483 821974; there could still be the odd vacant plot. Retired or senior people living alone in Brookwood are welcome to ‘Lunch With Others’. The group meets monthly for fish & chips, a chat and a chance to meet up with old friends and acquaintances and make new ones. (You can bring your own lunch if you prefer.) Call Sheila on 01483 489053 if you are interested. More than 100 of the children opened the fair by singing an action song: ‘Go for Goal’. Leading up to the fair, 8-a-side football teams competed in our own ‘World Cup’ knockout tournament. The final took place at the fair with South Korea triumphing over Uruguay 2 – 1. The Woking FC Mascot came along and was in goal for a penalty shootout competition. The theme week leading up to the fair had a Geography focus – ‘Our World’. The children studied the language, culture and physical and human features of 10 countries competing in the World Cup. As always, there was healthy rivalry over the best-dressed stall competition, with Brookwood Babies and Toddlers winning this year. The Art Group and WI were also well-represented, and ATR Pirbright sent two soldiers with equipment and camouflage paint. The Sure Start Children's Centre painted faces beautifully and Fulks' sausages and burgers went down very well on the barbecue. Brookwood Club very generously donated and sold beer and other refreshments throughout the afternoon – donating all their profits too! Not only was it a brilliant community event, but we raised £2,660 to fund much needed upgrades to the school's computers. Thank you to everyone who came along and helped make the day such a success! Follow his blog at: www.windowonwoking.org.uk/sites/cllr.kevindavis/weblog. It has links to websites where you can offer your opinion on the borough’s boundaries, have a greater say in the way crime and anti-social behaviour reports are dealt with and find out how to avoid a parking ticket. The third party consultant's report for the Green Belt Review to ensure the borough's housing needs from 2022 to 2027 are met has now been published and residents will be consulted over the next year. Kevin’s opinion is that Brookwood village is in a great position as it is effectively already developed as far as possible without going upwards. The report recognises that Brookwood is the only village left in Woking which is still surrounded by green belt and suggests it stays that way. Possible development towards Mayford could negatively impact Brookwood crossroads. Once it becomes known what is likely to happen, Kevin will be lobbying for the crossroads to be improved and Blackhorse Road to be made safer. Community Groups looking for funding? Please be in touch with me, I may be able to point you in the right direction to apply for a small grant. Having been in Brookwood for nearly 50 years, Wessons wanted to stay as close as possible and have now moved to a lovely new office in Knaphill (48 High Street). Their materials/yard will be about 10 minutes away from the office and they will be happy to make deliveries. They would like to thank all the local residents for their custom and support, and for raising concerns when Wessons was threatened with closure due to the redevelopment. They should be settled in by the time the newsletter is published and would welcome visitors. Can other business beat Wessons’ 50 years? Who has lived in Brookwood longest? My husband & I have clocked up 27 years but there are many who have been here longer. There is good reason why estate agents refer to Brookwood as the ‘black hole’. The Brookwood and Bridley Neighbourhood Area and Forum designation was obtained on 10th July. The BBNF is actively gathering the views of local people to ensure the area develops in a way that they would wish. If you are interested in an occasional email Community Update between newsletters, you can sign up through the Brookwood website: www.brookwood.org.uk (top right hand corner). The walk, visiting both sides of the cemetery, is led by Barry Devonshire. Meet 2pm at the entrance to the Glades of Remembrance, adjacent to the Cemetery Office on Cemetery Pales. No need to book but a small donation is suggested. For further details call 01344 89104. Brookwood Club has been at the heart of the village for well over 100 years. Starting off as a Working Men's Club, it saw a huge transformation in 2005/6 when the old premises were partly demolished to make way for a smaller club with an even bigger personality. The club is now run by the members for the members and is a thriving business. Aside from pool and darts, the club hosts monthly bingo sessions and weekly quiz nights, hotly contested by the brains of Brookwood! Live music is a feature of the club and the New Year parties are legendary. Our popular barbecue days are open to everyone. We pride ourselves on being a community enterprise and every year the members vote for two charities to support. Over the last few years, one constant has been our support for Brookwood Assisting Neighbours. (BAN). This local volunteer force has now been adopted by the club permanently, and half the money raised for charity by events at the club go to this local group. BAN was set up a few years ago to offer help to residents of Brookwood, Sheets Heath and the army camp who need transport to and from hospitals/doctors, or a little assistance with shopping etc. The whole venture is staffed entirely by volunteers. They are always on the lookout for helpers so if you have an hour to spare occasionally please give them a call. If not, then visit the Club during one of our fundraisers and buy a burger. A tasty way to help your neighbours! BAN: 07931 239365, Mon – Fri, 10am – 12noon (Membership of Brookwood Club is limited, but news of availability of places will be advertised). Do you have an old bike gathering dust in the back of your shed or garage? Why not look up the Guildford Bike Project (currently based in Woking) or Woking Cycle Stations? Both organisations collect old bikes and recondition them into usable affordable ones that they sell on. The Guildford Bike Project trains disadvantaged young people to do the work. You can buy refurbished bikes from them or get your own bike serviced. Woking Cycle Stations has volunteer mechanics of all ages who are able to transform a bike to get it back on the road. Anyone can come along to the project and help to build bikes or simply to repair their own bike. See the websites or call Guildford Bike Project on 01483 570521 or Woking Cycle Stations on 01483 750403. U3A stands for the ‘University of the Third Age’. It is not actually a university but a nationwide collection of local groups set up for and by people no longer in full-time work – in our ‘third age’. There is no minimum age, although most members are over 50. We run classes and activities led and taught by our members, for our members. The Woking group has nearly 100 to choose from, you can find out more at our open house. If you want to continue to learn and be active, and to make new friends, why not come along? You may enrol and join classes at this event. You can pop into St Saviour’s Church for coffee on Fridays between 10am and 12noon to meet new people and have a chat. community brookwood.org.uk Would you like to sponsor a newsletter? Delivered to every household in Brookwood!